On Tuesday, January 6, I was sworn into office to again represent the 34th Senatorial District, which includes all of Centre, Mifflin, and Juniata Counties and part of Huntingdon County. 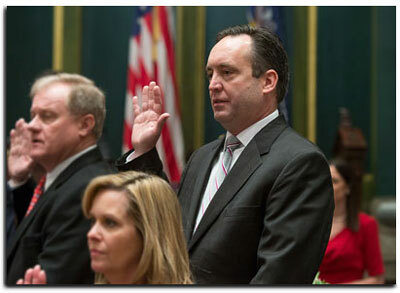 I am honored to serve you and will work hard to represent you both at home and in Harrisburg. This session, I have been elected by my colleagues to serve as Majority Leader of the Senate. In that role my duties will include overseeing the Senate’s legislative agenda, negotiating legislative issues with the Administration and House of Representatives, and supervising action on the Senate floor. As former chairman of the Senate Appropriations Committee, my top priority was controlling spending and keeping taxes down for working families and job-creators. As Majority Leader I will continue to promote fiscal responsibility, ensure that government lives within its means, and work to bring consensus on issues that are important to state residents. I see great opportunity to work together on issues that people care about and work hard to help our job-creators and get our economy moving in the right direction. Pennsylvania’s largest indoor agricultural exposition will take place January 10–17th in Harrisburg. Many folks in my district will be participating in the 99th Annual Farm Show, which showcases Pennsylvania’s number one industry. The eight-day show at the Pennsylvania Farm Show Complex and Expo Center will feature 6,000 animals, 10,000 competitive exhibits and 300 commercial exhibitors. Animal exhibits, rodeos, grape stomping, square dancing, a great food court and many other events make this a great place to come and bring the family. Admission is free and parking is $10. The Pennsylvania Farm Show Complex and Expo Center is easily accessed from nearby Interstate 81. For a complete schedule of Farm Show events click here. Cold temperatures and winter weather are prompting a reminder from the PA Department of Human Services that the Low-Income Home Energy Assistance Program (LIHEAP) is open. A 60-day notice of termination of utility service. Eligibility begins, for a household of one, with an income limit of $17,505 and increases by $6,090 per additional household resident. Applications for LIHEAP are being accepted online, on paper, or in person at the county assistance office. For additional information or questions, contact your county assistance office or call 1-866-857-7095. The Department of Community and Economic Development offers an array of financial aid grants, loans, tax credits and other incentives to help Pennsylvania businesses, communities and municipalities succeed. Grant programs include those that fund research and development projects and police regionalization to those that assist startup businesses and flood control projects. Loans are available for funding projects in distressed communities, jump-starting small businesses and more. Tax credits are awarded to help offset specific taxes associated with various activities, such as expanding a business, investing in a particular industry or donating capital to scholarship programs. You can search for aid by business, community or local government incentives, as well as individual categories, to find the right tool for you.